Now that is a good sweet spot imo. Damn nice job! 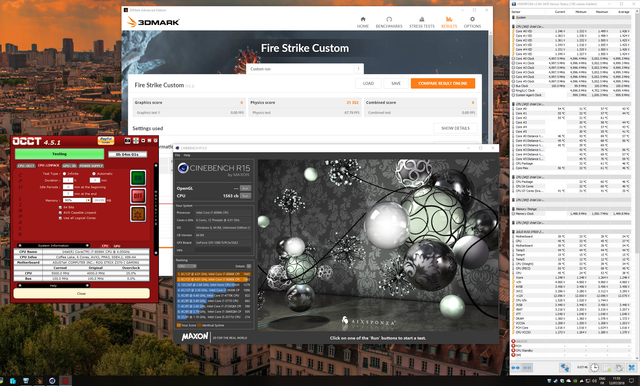 5GHZ 1.2v AVX Stable for OCCT, Cinebench, 3dmark Firestrike physics, gonna try some games and see if I get any crashes. You got a damn good chip there. Good work. No crashes on any games / Asus Realbench ok too but still cant run prime95 with small FFTS for more than 30 seconds. No bluescreen but workers stop with fatal error..
are you using manual voltage or adaptive? Manual, for the moment. Adaptive I still need to dial in. Removed manual voltage and re-enabled intel speedstepping features with adaptive voltage negatif offset 0.075v which gets me to 0.62v when idle and up to 1.2v when under load, all seems stable for 5ghz. Lost a couple of degrees on Idle temps also, they are now hovering around 28-29c mark compared to manual voltage where idle temps were mid 30s. Had another play with Prime95 small FFT's and it seems that I need 1.275v to be stable at 5ghz although I only left if for an hour. But there is absolutely no workload in my lifelike this so I'm just keeping it at 1.2v.